The Hobart/Barr/Lucking Initial Residence c. 1898. 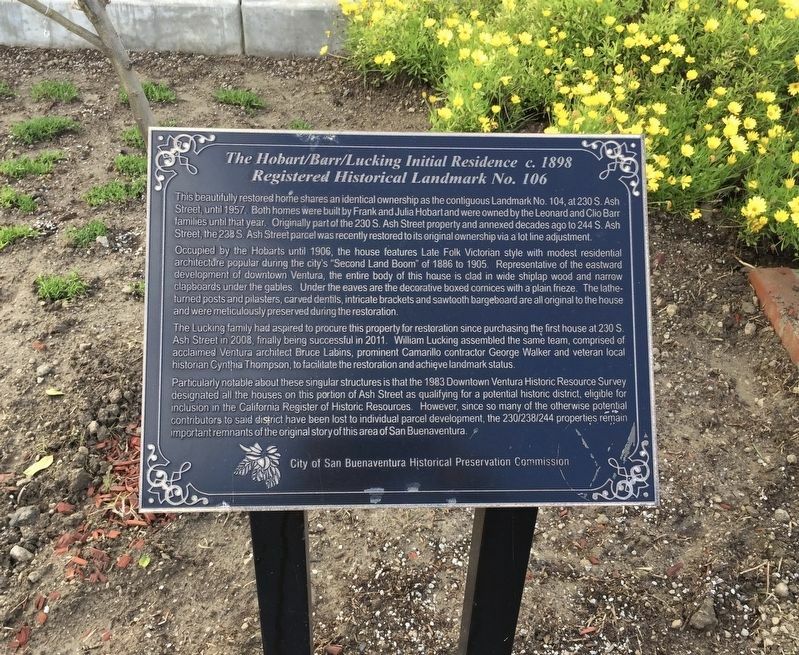 Registered Historical Landmark No. 106—. This beautifully restored home shares an identical ownership as the contiguous Landmark No. 104, at 230 S. Ash Street, until 1957. Both homes were built by Frank and Julia Hobart and were owned by the Leonard and Clio Barr families until that year. Originally part of the 230 S. Ash Street property and annexed decades ago to 244 S. Ash Street, the 238 S. Ash Street parcel was recently restored to its original ownership via a lot line adjustment. Occupied by the Hobarts until 1906, the house features Late Folk Victorian style with modest residential architecture popular during the city's "Second Land Boom” of 1886 to 1905. Representative of the eastward development of downtown Ventura, the entire body of this hause is clad in wide shiplap wood and narrow clapboards under the gables. Under the eaves are the decorative boxed cornices with a plain frieze. The lathe-turned posts and pilasters, carved dentils, intricate brackets and sawtooth bargeboard are all original to the house and meticulously preserved during the restoration. The Lucking family had aspired to procure this property for restoration since purchasing the first house at 230 S. Ash Street in 2008, finally being successful in 2011. Wlliam Lucking assembled the same team, comprised of acclaimed Ventura architect Bruce Labins, prominent Camarillo contractor George Walker and veteran local Cynthia Thompson, to facilitate the restoration and achieve landmark status. This beautifully restored home shares an identical ownership as the contiguous Landmark No. 104, at 230 S. Ash Street, until 1957. Both homes were built by Frank and Julia Hobart and were owned by the Leonard and Clio Barr families until that year. Originally part of the 230 S. Ash Street property and annexed decades ago to 244 S. Ash Street, the 238 S. Ash Street parcel was recently restored to its original ownership via a lot line adjustment. The marker is visible here between the two parked cars on the left. at 230 S. Ash Street in 2008, finally being successful in 2011. Wlliam Lucking assembled the same team, comprised of acclaimed Ventura architect Bruce Labins, prominent Camarillo contractor George Walker and veteran local Cynthia Thompson, to facilitate the restoration and achieve landmark status. 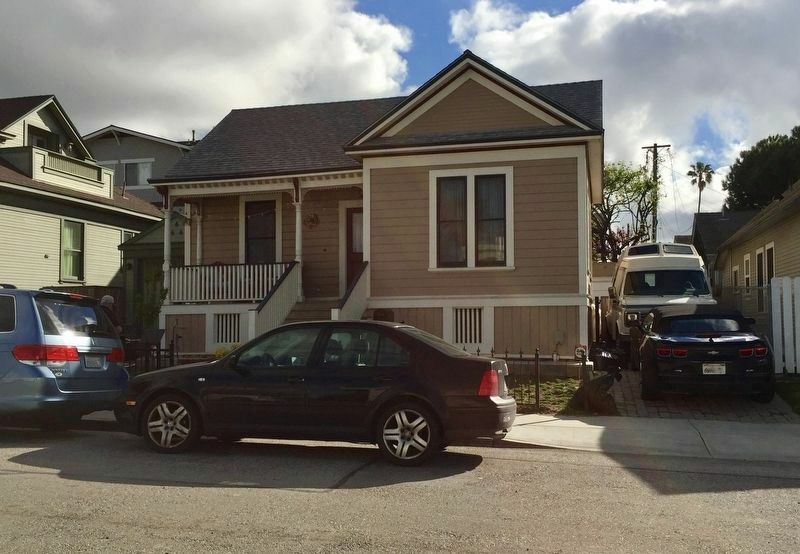 Particularly notable about these singular structures is that the 1983 Downtown Ventura Historic Resource Survey designated all the houses on this portion of Ash Street as qualifying for a potential historic district, eligible for the California Register of Historic Resources. However, since so many of the otherwise potential to said district have been lost to individual parcel development, the 230/238/244 properties remain important remnants of the original story of this area of San Buenaventura. Location. 34° 16.664′ N, 119° 17.3′ W. Marker is in Ventura, California, in Ventura County. Marker is on South Ash Street near East Thompson Boulevard. Touch for map. Marker is at or near this postal address: 238 South Ash Street, Ventura CA 93001, United States of America. Touch for directions. Other nearby markers. At least 8 other markers are within walking distance of this marker. The Hobart/Barr/Lucking Residence (a few steps from this marker); Sifford House (about 400 feet away, measured in a direct line); 682 East Thompson Boulevard (about 600 feet away); Site of the Mayfair Theater, 1941-2000 (about 700 feet away); 632 E. Thompson Boulevard (approx. 0.2 miles away); Dacy Fazio House (approx. ¼ mile away); Ventura Theatre (approx. ¼ mile away); Groene Building (approx. ¼ mile away). Touch for a list and map of all markers in Ventura. More. Search the internet for The Hobart/Barr/Lucking Initial Residence c. 1898.